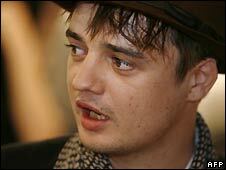 Babyshambles frontman Pete Doherty has been jailed for 14 weeks for violating his probation and for using drugs. Judge Davinder Lachar handed the musician the sentence at a court hearing in west London. Doherty had been given a suspended jail sentence for possession of drugs and driving illegally in October last year. His supervision order required him to make regular visits to court for progress reports, as well as take part in a drug rehabilitation programme. The BBC's David Sillito said the singer had missed one appointment with his probation team and been late for another. The punishment means Doherty has been forced to postpone a concert at the Royal Albert Hall in April. The gig would have been his biggest solo show yet. The show is due to be rescheduled and all tickets will be valid for the new date once it has been announced. The star's record label said in a statement: "Peter was very much looking forward to the show and would like to offer his sincerest apologies to all his fans and to all those concerned." Speaking to BBC 6 Music, Babyshambles drummer Adam Ficek said: "I feel gutted for him. Obviously he's going to find it really difficult in there but all I can say is that the band is going to stick with him as always." He said they planned to continue writing and and making music with him and will get in touch with Doherty as soon they can. "As far as I see it I hope we can really look positively on this and when he comes out he can learn from the mistakes he's made and we can persevere with the path that Babyshambles was treading before," added his bandmate. Under current rules, the Doherty is likely to serve around a month of his sentence. But if he spends the full 14 weeks in prison, he will miss a headlining slot on the Park stage at the Glastonbury Festival. In the past the singer, who rose to fame after forming the Libertines in 1997, has admitted that staying off taking drugs was not easy. Last November he admitted suffering a drug relapse and vowed to seek further to help him tackle his heroin addiction. Doherty, who used to date model Kate Moss, has repeatedly appeared in court for various drug offences.